In maritime battle history, much has been written about the interception and sinking of the Bismarck. In a four-day battle sequence riddled with stories of the unexpected, one of the most dramatic is that of the US Coast Guard Cutter Modoc; a small ship caught up in the middle of a very big battle. Fog, mistaken identity, and providence all play a role in her singular wartime adventure. On May 24th, 1941, the Modoc, whose mission was to patrol allied convoy lanes for survivors of German U-Boat attacks, is heading east in the Denmark Strait, tracking the remains of an eastbound convoy. At twilight, the crew observes a huge gray vessel heading rapidly southbound. It is the Bismarck, recent from battle with the British blockade where she succeeded in sinking the HMS Hood. 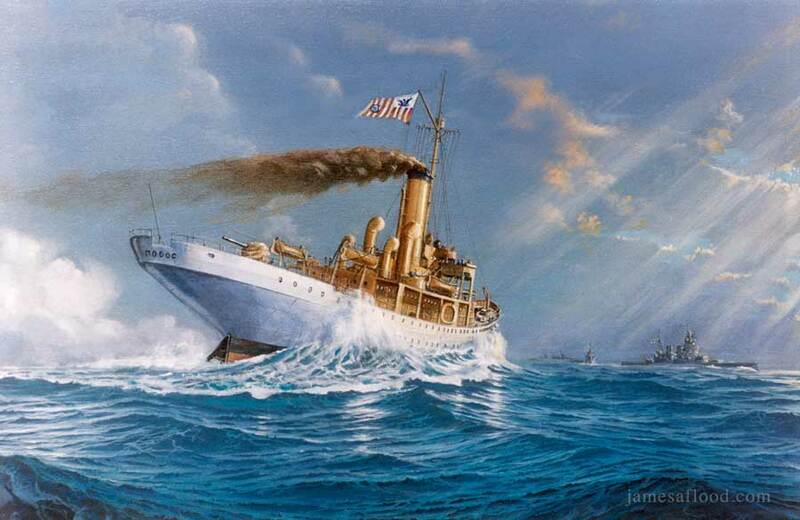 Damaged from the engagement, she is moving full steam ahead now, her guns trained on the centerline, attempting to outrun or outfight the vengeance-driven British Fleet and escape to the Atlantic. Overhead, fighter aircraft from the HMS Victorious, in hot pursuit, begin their attack on the Bismarck. In the ensuing exchange, flaming remnants fall all too close to the small cutter, compelling her to rapidly seek an escape route. As the Modoc attempts an exit, her situation becomes even more perilous. The British commanding officers on the pursuing battleships, unaware of the Modoc’s presence, are unable to identify her. Having just lost the Hood and on the lookout for sneak maneuvers from the Germans, any unknown vessel is suspect. Not willing to take any chances, preparations are made to attack. The Prince of Wales takes aim, awaiting the signal to fire. With huge guns pointing directly at her, the Modoc turns towards the protection of a nearby fogbank. Her pounding antiquated steam engines, forcing huge clouds of black smoke through her buff funnel, do little to boost her inherent slowness. But onboard the Prince of Wales, the signal flag acknowledging the order to commence fire jams, delaying the firing of guns*. Before the issue is resolved, the Modoc vanishes into the safety of the mist. She survives unscathed and later returns to her patrol, lasting throughout the war.